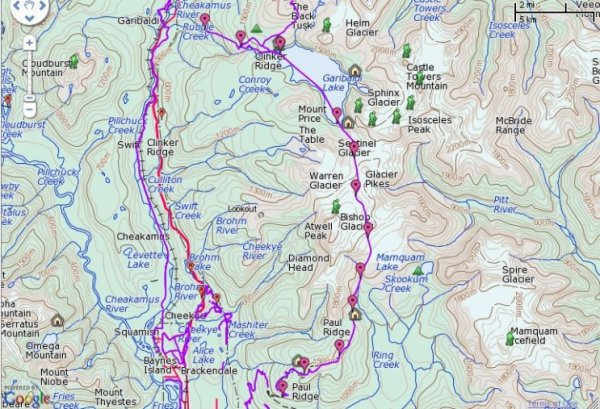 You can conveniently make custom maps for presentations, educational materials, field work/research, backcountry trip planning and reporting, bulletin postings, etc. Use a variety of symbols/icons, import data layers and draw lines and polygons. More and more organizations (govermental, educational, non-profit) are making their data open and accessible to the public. Variety of spatial data are available for different applications in many areas of the world. 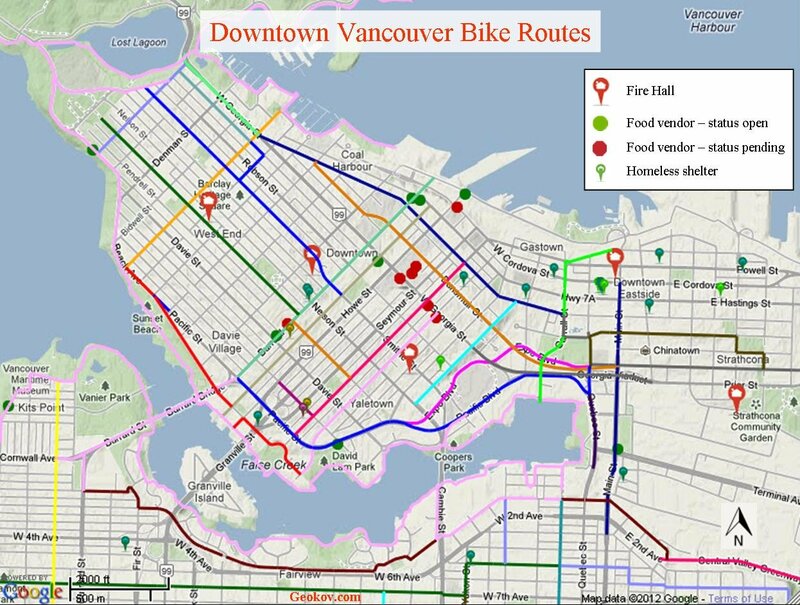 The Map Maker enables you to visualize and combine spatial data from different sources. You do not need to purchase or download a special GIS software or have any prior map making knowledge. Watch the introductory video for an overview of the Map Maker functionlaity. GIS data can come in one of several different formats. The main data type used by Google Earth and web mapping applications such as Google Maps and Microsoft Bing Maps is an XML-based data format called KML (Keyhole Markup Language). KMZ is the compressed (zipped) format of KML. Apart from KML/KMZ, Geokov map maker allows for loading and visualization of other data types such as GPX (GPS data format), GeoRSS, KML Network Link, GML, and WMS (Web Map Service). Check the videos below and read the directions in the map maker page. Websites offering data and data portals usually have links for downloading their data. You do not need to download the file in order to import it to the map in the Geokov map maker. In such cases you can copy the file URL by right-clicking its download link, copying the URL and pasting it in the appropriate text box for data import. In order to import a local file to the map, you will have to open the file with a text editor (e.g. wordpad), copy its contents and paste in the appropriate text area. A more standard and user-friendly method for local file upload will be implemented in the future. ***IMPORTANT*** There will be times when you can successfully load and visualize a KML or KMZ file in Google Earth but won't be able to render the same file in Google Maps or Geokov Map Maker. Google Maps as opposed to Google Earth has some limitations in terms of the KML file size and its structure. Therefore some files that fail to upload maybe too large or have some tags and elements in their structure that are not supported by Google Maps. You can find more information for KML support of Google Maps in the following pages: https://developers.google.com/kml/documentation/mapsSupport, https://developers.google.com/kml/documentation/kmlelementsinmaps. One of the popular GIS file formats that you are likely to come across is "Shapefile" by ESRI. You can not upload a shapefile to the map directly at this time. You will need to first convert the shapefile to KML. Make sure that you set the coordinate system of the GIS file to Geographic Coordinate System with WGS84 datum and ellipsoid (i.e. EPSG 4326 coordinate reference system). 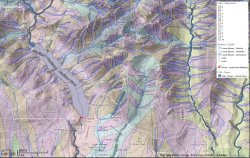 Major GIS software nowadays should have conversion to KML or GPX formats. However for a free and fast solution you can use the Zonum shp2kml tool for conversion between the ESRI Shapefile and KML. If you have access to a GIS software you can also convert other GIS data formats to KML in order to add them to the map. You can not edit a file after importing it to the Geokov map maker. This functionality will be implemented in the future. If you have a local file, you can open it in Google Earth, edit it as desired (position of elements, colors, etc.) and save it in your computer. The new file can now be imported into Geokov map maker. Remote files can not be edited. 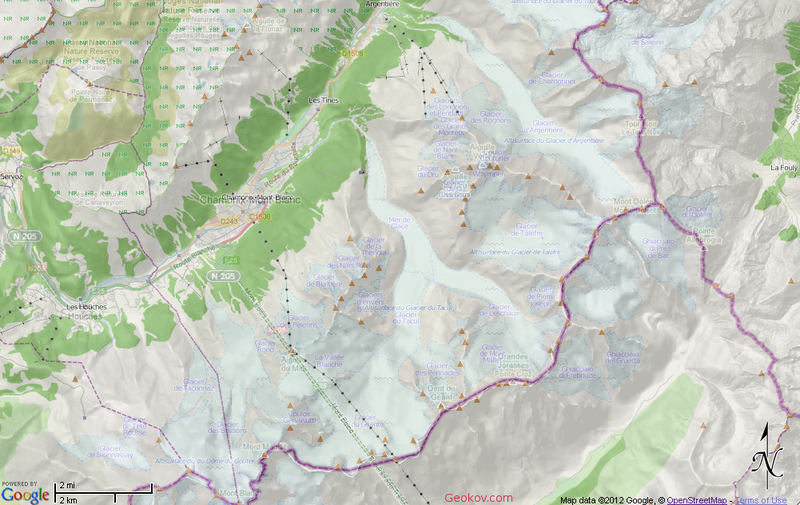 Create map mashups by uploading KML, GPX, GeoRSS and GML files to the map from various sources. Add KML network links for dynamic up-to-date data. Visualize data on different base maps. Click on video. Overlay Web Map Service (WMS) on the map. In "Google Earth" add WMS server URL and select layers of interest. Then save selected data from Google Earth as KML in your local directory. Open the KML file with a text editor (e.g. wordpad) and paste contents into text area in the map maker page. Zoom in and wait for data feed to show on map. You can set the transparency of data in its properties dialogue in Google Earth. Click on video. 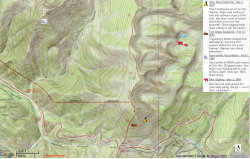 Create shaded-relief topo maps by overlaying a topographic map (from the 'Topography' folder of 'Add Data to Map' section) on top of Google Maps "Terrain" base, and adjusting its opacity. You can choose "OpenCycle" map for worldwide topo map layer. Click on video. 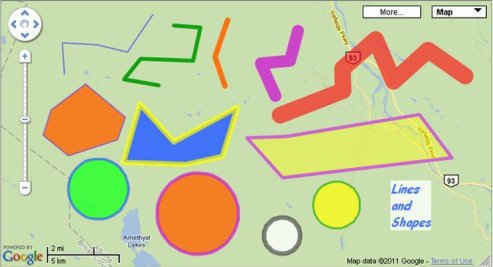 A number of different icons for outdoors, environmental and emergency mapping can be added to the map; customized icons and labels can be created. You can also add any icon/symbol you see online in your web browser by inputing its URL address as explained here. Lines and polygons can be customized by changing their color, width and opacity. Edit the shape of a line or polygon by mousing over it and dragging any of its vertices. Click on a main vertex to delete it. 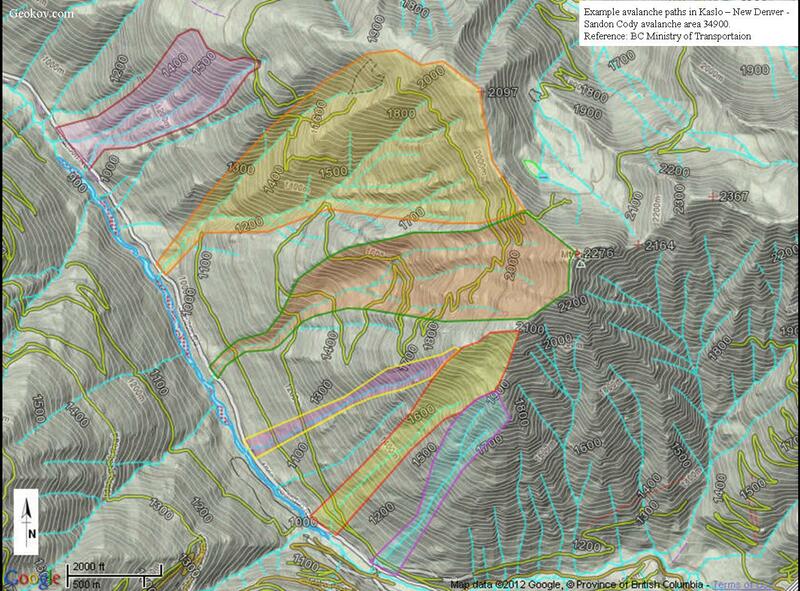 In this map, we want to draw the elevation profile of a ski traverse (the path to the right with markers). You can use the line drawing tool to draw the route (or connect GPS waypoints). Export the route as a KML, copy and paste the content of the text area into a text editor (e.g. wordpad) and save the file with .kml extension. Open the file with Google Earth. If you already have GPX or KML file, you can import it directly to Google Earth. The elevation profile of the path in Google Earth is created by choosing "Show Elevation Profile" from the Edit menu, or right-clicking on the path in the "Places" section in the left pane. Detailed explanation of the elevation profile is provided in the Geokov education section. 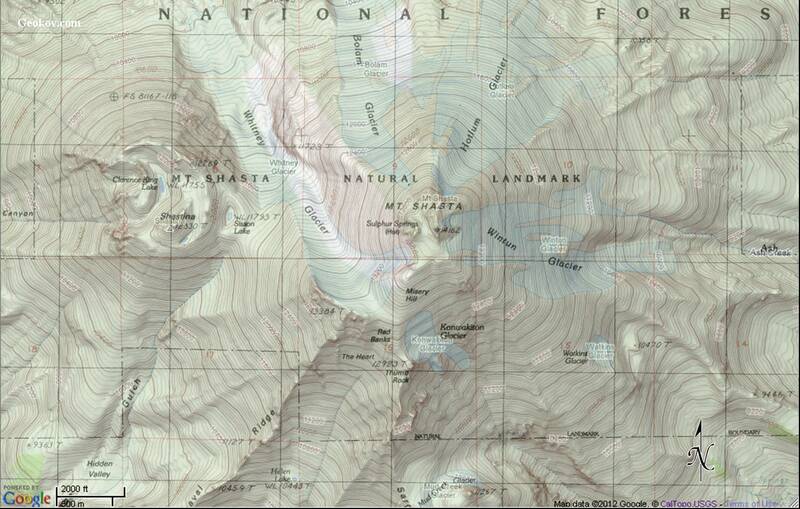 Topo map © Department of Natural Resources, Canada. The print function can be accessed from the 'File' menu of your browser. Note that the print feature may not work consistently across all browsers especially when there are data layers overlaid or icons and features drawn on the map. Colors may change when printed and the overall print quality may be unacceptable. Print functionality will be improved in future. An alternative method with better quality is to save the map and the legend as images before printing. This method provides more flexibity in the final presentation and layout of the map. You can use the print screen (Prt Scr in Windows) function to get a screenshot of the visible content in your monitor, and then paste and crop the resultant image in an image editing program (e.g. Paint, Gimp, Photoshop), MS Word or Powerpoint. A more convenient solution is to use a freely available screen capture software to capture the image of any part of your screen. For example you can save the image of the map, and afterwards capture the image of the legend. The images can then be pasted in Powerpoint and positioned as desired in relation to each other. Text can be added to the side or inside the map as well as a neat line to make it look more professional. The whole process takes few minutes. There are a variety of free and powerful software for image capture and manipulation. You can use Jing (http://www.techsmith.com/jing.html) to conveniently select and capture the image of any part of the screen. GIMP (http://www.gimp.org/) is a powerful image editing software similar to Photoshop. RIOT - Radical Image Optimization Tool (http://luci.criosweb.ro/riot/) can be used to compress and optimize your images; you can obtain much smaller file sizes without sacrificing quality. In order to leave out the map Zoom/Pan controls and the menus at the top of the map from the printout, extend the map height so that the desired area falls below the 'Zoom' control (grab and drag the lower right corner downward or specify larger height value in the 'Map Size' text box). You can then capture the image of the desired lower portion with Jing. Save the image file to the desired folder. Copy the image and paste it to an empty slide in Powerpoint. If there is a legend, you can capture its image and, similar to the map, paste it to the Powerpoint slide. Resize and move the legend and map to get a desired layout. Add any other elements or text. Select and group all the elements on the slide, and save the slide as picture. A legend can be created in powerpoint also. Draw a legend box with the rectangle tool. For shapes, draw a square and specify desired color for fill. For lines, draw a zig zag line with desired color and thickness. Icons and symbols can be captured and saved as images with Jing, and then pasted into the legend box. Infront of each legend symbol, write the description. Use GIMP to scale the map image to the desired size (Scale Image under Image menu). RIOT can be used to compress the file size in order for it to be pasted on a document (e.g. Word), emailed, posted on the Web, etc. If you are just capturing a section of the map and don't need a legend, just save the image with Jing, scale with GIMP, and compress with RIOT. ***IMPORTANT***: As discussed in the map scale education section, you need to be careful when working with scales of digital maps. 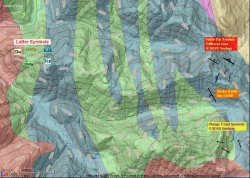 When you save, do any format conversion or print the digital map, there will be some distortion or resizing of the map. 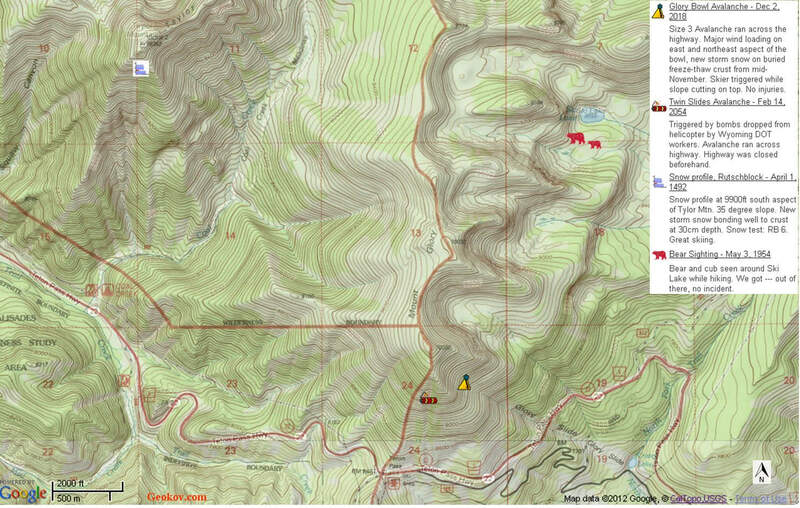 Make sure you use the Google bar scale on the map for measuring distances and do not rely on the representative fraction (fractional scale of the topo maps). Also for any serious map and compass navigation do not rely on copied and printed maps that might have any kind of distortion. Make sure you read the Google's terms regarding copying and printing Google Maps and Google Earth maps and images (links are provided in Geokov Terms and Conditions page). The attribution below the maps should always be clear when you copy and print the maps. In case they are unclear or do not show, make sure the exact attribution is included as text outside the map. Also please include an attribution for Geokov (including web address) for any maps created or images and content copied from this site. 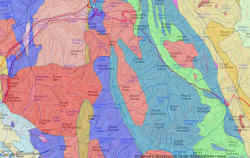 BC bedrock geology (WMS) overlaid on topographic map NR Canada Toporama with adjusted opacity. BC TRIM topo (WMS) overlaid on Terrain with adjusted opacity to show relief. Paths drawn with polygon tool. BC watersheds, streams, rivers, and dams layers overlaid on Terrain. Watershed layer's opacity adjusted to show some relief. 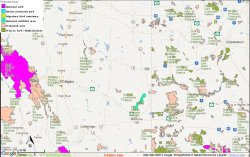 Atlas of Canada Protected Areas (WMS) overlaid on 'Map' - Southern Alberta and Saskatchewan. 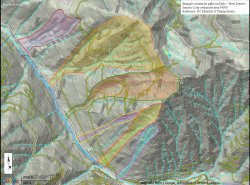 USTopo map layer overlaid on Terrain with adjusted opacity to show relief. Mt. Shasta, California. 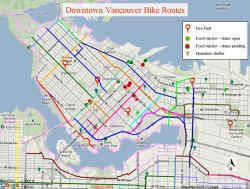 Some KML (KMZ) data from City of Vancouver Open Data Catalogue - Downtown Vancouver bike routes. 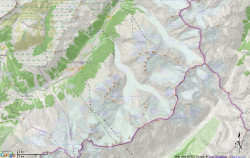 OpenStreetMap (Mapnik from topography folder) overlaid on Terrain with adjusted opacity to show relief - Chamonix - Mont Blanc area, France. You can store your data in Google's servers, and access and import them to Geokov Map Maker whenever desired! Sign in to Google Maps (create a Google account if you don't have one). Go to “My places” and click "Create Map". Here you can upload your local data (or data sitting on another server) in the form of KML, KMZ, or GeoRSS to the Google Maps. You can make the data added to the map "public" or "unlisted". Different maps can be created. If you have GPX data, upload it to Google Earth and then save as KML to store in your Google Maps account. KML network link data can be uploaded and stored in Google Maps also. Whenever you need to import the stored data to Geokov Map Maker, in Google Maps "My Places" click on the desired map containing the data you want, then above the listed layers, right-click on KML and "Copy link address". Now paste this URL for KML Network Link to the textbox at the bottom of Geokov Map Maker page and upload the remote file to the map. In the case of WMS data, you'll need to download KML, open it and paste the contents in the upper text area of the Map Maker and upload to map. After you make a map in Geokov Map Maker, you can export the data as a KML file and upload and store in Google Maps as above. 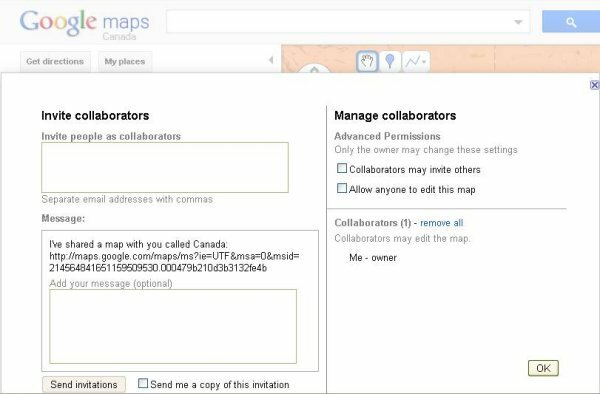 Click on the desired map in "My places" and click on "Collaborate" botton to share your data and enable others to edit your drawings. Other people can upload your drawings to their Geokov Map Maker and overlay them on their desired base map or mashup with other data. At this time when data is uploaded to Geokov Map Maker it can not be edited (this will be enabled in future). Therefore any editing should be done in Google Maps, after edits are done, you can upload the result to Geokov Map Maker. You can import and export XML-based GPX (GPS eXchange Format) files to and from Geokov map maker. GPX is a common and open data format used by GPS devices and applications. To upload a GPX file to the map, open it with a text editor and copy and paste the file content into the white text area. Click on "Load File to Map". You can export your drawings on the map in the form of GPX. Copy the text from textarea to a text editor (e.g. wordpad) and save the file with correct extension (.gpx). You need to export again after any new edits to the map. Icons placed on the map will be stored as "waypoints", while lines and shapes drawn on the map will be stored as "routes" in the GPX file. You can also import and export data directly from and to the popular Garmin GPS device. You need to install the Garmin Communicator Plugin to enable communication with your Garmin device through this website. It's a good idea to backup your GPS device data (e.g. 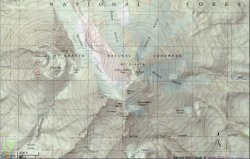 with a GPS software such as MapSource) before accessing it by Geokov. Once you've installed the Garmin Communicator Plugin, connect your device to the computer and turn it on. Upon clicking on "Find Devices" you'll get an alert box by which you'll be prompted to allow or disallow access to your Garmin device from the Geokov web page.